With their lifespans shortening, computers are filling up landfills and threatening environmental health. And Hawaii has no way to deal with the problem. What everyday appliance contains poisonous lead, mercury, cadmium, hexavalent chromium and halogenated flame retardants? Hint: For a large part of the day, it's in your face. Literally. Yes, the culprit is your computer. From the glass in your monitor to the solder on your circuit boards, it can contain as much as six pounds of lead alone. Even for heavy users, these toxic substances are no problem. It's when you buy a new computer, and discard your old one, that we have a problem: potential danger to the environment. "Computers should be edible," says James Kerr, president of the Honolulu computer company Super Geeks, "or at least biodegradable. It's a real concern in Hawaii, what to do with them when they're no longer useful." According to the National Safety Council, the useful life of today's computer is about three years. Of the more than 31 million that will be retired this year in the U.S. alone, no more than 10 percent will be recycled or given away. The rest will get stashed in the closet or thrown into dumpsters and landfills. The techno-junkpile grows exponentially, matching the speed of a shrinking microchip. "Throwaway technology is as vast and available in Hawaii as it is anywhere else in the country," says Alan Hornstein, owner and president of the Oahu recycling company Lenox Metals. "But we're more sensitive, because we live on islands." Massachusetts bans cathode ray tubes (computer monitors and TVs) from landfills, but similar legislation does not yet exist in Hawaii. Neither does a government-mandated computer recycling program. "There's no formal apparatus in place," says Kerr. "Everyone in this business shares a similar frustration. We need an intense recycling program like the one they have in Japan, and that will take a galvanized effort." On the Mainland, new computer demanufacturing and recycling companies are beginning to appear. They gut the PCs, separate the components, dispose of the hazardous waste, and find uses for everything that's left. In Massachusetts, the plastic casing from computers fills potholes in the turnpikes. In Hawaii, the best thing to do with your old computer is find a school or charity that will have it fixed, upgraded and sent off to a new life. (CompUSA Hawaii will give your computer to the DOE.) But, as far as recycling goes, currently only one company in the Islands will take an old computer off your hands: Lenox Metals. "It's an economic scenario," says Hornstein. "What's the incentive? For most companies, it's not advantageous or profitable to disassemble a computer and separate the components. And it's not worth much even after that." Hornstein claims he makes hardly any money on computers. "I've had a market for electronics and telecommunications gear for almost 20 years," he says. "My clients began accepting the computers with the rest of it." He sells to countries such as China, Malaysia and Indonesia, big buyers of recycled metals. Across two oceans, the European Commission has issued a directive that proposes placing the responsibility - and cost - of collecting and recycling computers from private households squarely with computer manufacturers. Needless to say, the manufacturers aren't happy about it. Hornstein understands why: "For a company like IBM or Compaq to tool up for that kind of recovery and recycling operation, the cost would be astronomical. Internationally, everyone would have to buy into the program, or you wouldn't have a level playing field. The governments would need to impose regulations." But regulation could also take a different form. "If computer manufacturers were held accountable," says Kerr, "they would learn to design computers that are easier to upgrade. They would have parts we could replace, so we wouldn't need to toss out whole system just to keep up. The overall unit could stay the same for many years." 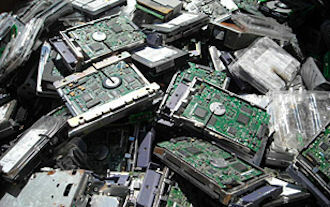 For now, the best solution seems to lie with the handful of start-up computer recycling companies on the Mainland. One of the country's largest, Fox Electronics, recycles 900 tons of computers a month, resells the memory, CPUs and hard drives, then sells the scrap for the extraction of component metals such as steel, aluminum, platinum, silver and copper. In minuscule amounts, computers are even gold mines: the average PC contains about one gram of the stuff.